Gap Mountain is so-named for a prominent saddle or “gap” between its twin summits as seen from the west in Troy. The key attractions at Gap are the stunning vista of Mt. Monadnock looming just to the north and the summer high- and low-bush blueberry crops ringing the open ledges of the north summit. Volunteer land stewards from the Forest Society periodically maintain the openings along the upper reaches of the trail to help sustain the blueberries. The forest on Gap Mountain is a legacy of extensive farm pastures which formerly extended over the entire mountain, including the 1,862 foot summit. Today, the lower slopes of Gap Mountain are cloaked in second-growth forest of white pine and red oak. The remains of a former apple orchard can be found along the excellent hiking trail from the Jaffrey trailhead on the east, which crosses the historic stonewall-lined Gap Mountain Road. Gap Mountain Reservation is leased to the State of NH and is managed as part of Monadnock State Park. Gap is home to a number of beautiful vistas, cultural features, and flora and fauna. If you're searching for mobile maps and an interactive trail experience to help you learn more about Gap Mountain as you hike this property, try our new web-based trails app called NH Forest Explorer! To try the app, visit forestsociety.org/FE on your mobile device, click the drop-down menu, select "Gap Mountain" and start exploring. There are 3 summits on Gap Mountain. The south summit is wooded with no views. (The “gap” in Gap Mountain is between the south and middle summits.) Both the middle and north summits have excellent views of Mount Monadnock and the surrounding country. From the North parking lot, it is a 2.4 mile round-trip hike to Gap Mountain’s north summit and back. This is a strenuous hike over steep terrain, so please be sure you have sturdy footwear and plenty of water. Follow the trail that leaves from near the kiosk, and almost immediately you will come to the Metacomet Monadnock/Royce Trail (white blazes). Turn to the RIGHT (west) here, making sure you are on the white blazed trail and follow the white blazes all the way to the summit of Gap Mountain. Be sure to turn left off the Metacomet-Monadnock Trail and back to the parking lot on your return trip. From the south parking lot, it is a 2.6 mile round-trip hike to Gap Mountain’s middle summit and back. This is a strenuous hike over steep terrain, so please be sure you have sturdy footwear and plenty of water. From the South parking lot, follow the yellow blazed trail 0.4 mile to where the trail merges with the Metacomet Monadnock Trail (white blazes). Continue straight ahead on the M/M trail, following the white blazes, emerging on the middle summit at 1.3 miles. If you wish to visit the north summit, follow the white blazes down into a swampy area and then back up to the summit (0.1 miles beyond middle summit). NOTE: On returning to the parking lot, remember to look for the yellow blazed trail to the parking lot on the left just after crossing the stream. The 50 mile Wantastiquet-Monadnock Hiking Trail (WMT) can now be hiked over its whole length from Brattleboro to Mt. Monadnock. 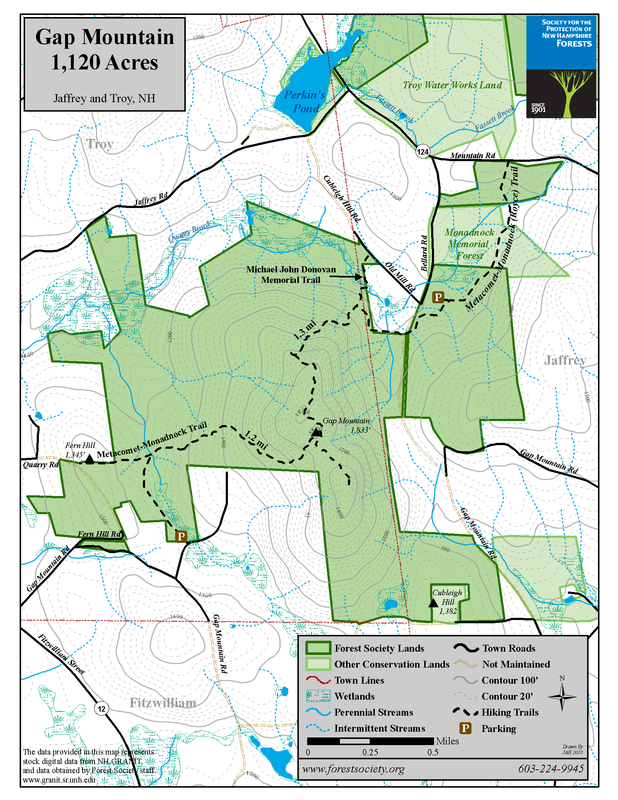 Download maps of the trail and five section hikes. During the 1930s and 1940s, a substantial part of the northerly portion of Gap Mountain, Carboni Pasture, was owned by a cattle and horse dealer. It was purchased with other adjoining land by investors who eventually incorporated themselves into the Gap Mountain Company. The Gap Mountain Company initially planned to develop the mountain for 50 house lots and an exclusive ski tow, but eventually put the land on the market. In 1973 a dedicated group of local citizens formed the “Friends of Gap Mountain” (FOG) organization in hopes of preventing development of this land. They approached the Forest Society in 1973 and began the conservation process. Their fundraising efforts combined with a major gift from an anonymous donor enabled the Forest Society to purchase a 636-acre tract in 1974. Later that year, a 110-acre tract spanning the south slope of Gap Mountain in Troy was donated to the Forest Society by Jane Fiske. Her father John Noble, a Boston lawyer and one of New Hampshire’s first conservationists, had purchased the property in the 1920s to prevent it from being developed into a hotel. To acknowledge his foresight in conservation, the land was designated in his memory as the John Noble Memorial Reservation. In 1986 Albert Gins from New Jersey donated 40 acres – the top of one of the peaks of the mountain. The following year, John T. and Joan B. Tyler purchased 20 acres and subsequently turned them over to the Forest Society to add to the reservation. These generous donations, along with purchases of land, have brought the total size of the reservation to 1,160 acres. We gratefully acknowledge the efforts of landowners and local citizens who have helped protect and preserve this gem of a property.